commented on "The band's Autumn Concert, held in the Holy Trinity Anglican Church on Saturday 9th April 2011, was a great success! ..."
The band's Autumn Concert, held in the Holy Trinity Anglican Church on Saturday 9th April 2011, was a great success! 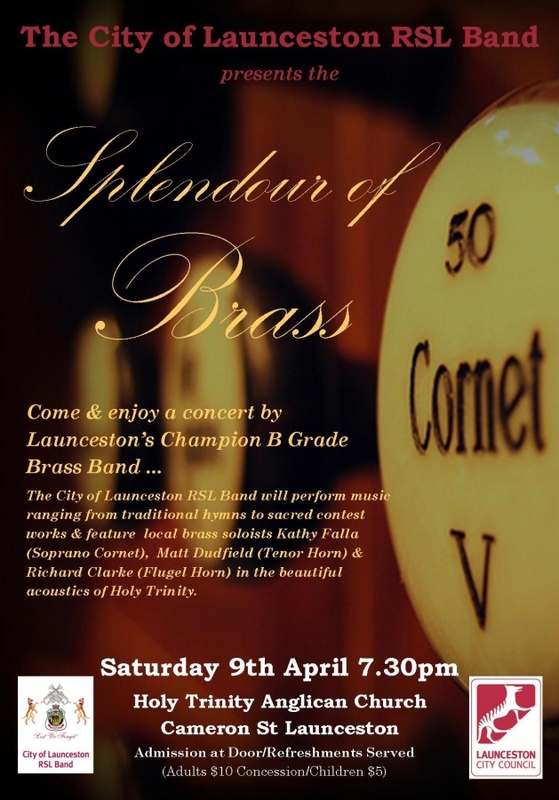 Come & enjoy a concert by Launceston's Champion B Grade Brass Band...The City of Launceston RSL Band will perform music ranging from traditional hymns to sacred contest works & feature local brass soloists Kathy Falla (Soprano Cornet), Matt Dudfield (Tenor Horn) & Richard Clarke (Flugel Horn) in the beautiful acoustics of Holy Trinity.